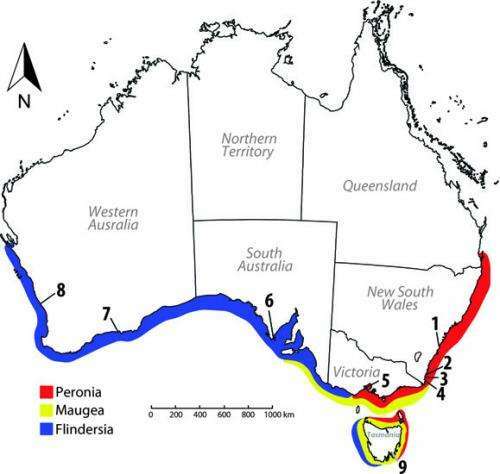 Map of Australia showing the three biogeographic provinces and sampling sites included in the U-M clam study. Map by Jingchun Li. 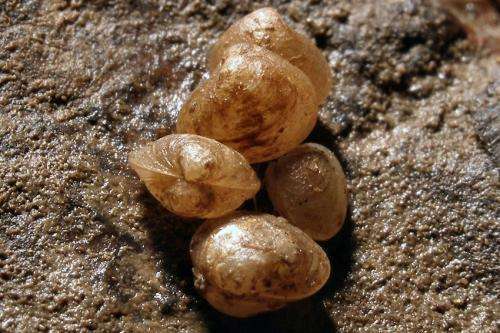 Two University of Michigan marine biologists have identified three cryptic species of tiny clams, long believed to be members of the same species, which have been hiding in plain view along the rocky shores of southern Australia for millions of years. The unusual convergence of a climate-cooling event and the peculiarities of local geography caused the three cryptic species to split from a common ancestor more than 10 million years ago, the U-M researchers propose in a paper to be published next month in the journal Molecular Ecology. The U-M scientists conducted a genetic analysis after collecting thousands of the crevice-dwelling, rice grain-sized clams from hundreds of miles of southern Australia coastline over the past decade. Their findings provide insights about the forces that shape evolution and solve a puzzle that has stumped marine biologists for decades. "This study provides important clues about how marine regional biotas can evolve, including our observation that these processes can involve major global climate change modulated by local geography," Jingchun Li, lead author of the report and a doctoral student in the U-M Department of Ecology and Evolutionary Biology. Li conducted the research as part of her dissertation with co-author Diarmaid O'Foighil, Li's adviser and director of the U-M Museum of Zoology. "You cannot tell them apart physically, but their genes indicate that their evolutionary divergence predates that of humans from chimpanzees," O'Foighil said of the three clam groups, which are currently classified as members of the same species, Lasaea australis. Australia's southern coastline is home to three evolutionarily distinct assemblages of marine species known as biogeographic provinces. Each province contains hundreds of species of invertebrates, fish, algae and other organisms, and there are substantial differences between the species living in each province. Here's the riddle that has perplexed biologists for decades: How did these three distinct biogeographic provinces evolve along a continuous coastline? The emergence of new species often begins when gene flow between populations is reduced or eliminated. This type of genetic isolation happened routinely throughout evolutionary history when populations became physically separated—when a new physical barrier such as a mountain or a river split the geographic range of a species, for example. But what force could drive speciation along an unbroken coastline with no obvious barriers to gene flow? The genetic analysis by Li and O'Foighil, which is backed by evidence from the fossil record, shows that the three cryptic clam species began splitting away from a common ancestor 13 or 14 million years ago. That's about the same time that a major climate-cooling event called the middle Miocene climate transition permanently lowered sea-surface temperatures in the southwest Pacific Ocean—including the southern coast of Australia—by 10.8 to 12.6 degrees Fahrenheit. Li and O'Foighil propose that the cooling event partitioned Australia's southern coastline into three zones with a cool region, including the present-day southeastern state of Victoria and the island of Tasmania, flanked on either side by two relatively warm ones. The emergence of three temperature zones created opportunities for local adaptation that isolated the organisms living within each zone. That isolation led, in turn, to the evolution of the three biogeographic provinces seen today, according to Li and O'Foighil. In their study, Li and O'Foighil showed that each of the three cryptic clam species is found in only one of the three biogeographic provinces. "I know of no other case where you start out with one marine biota, then a climate-change event results in the generation of three biotas from that one," O'Foighil said. "A key finding of the study is that relatively ancient climate-change events can shape marine biotas." Someone needs to have a word with Jingchun Li. Is he getting paid for two maps?